Member of Parliament for Bosome Freho Constituency Hon Joyce A.A Dei has extended electricity to 34 communities in the Bosome Freho Constituency in Ashanti region. The communities include Keteke, Anomobi, Kwame Ntow, Appiah krom, Damascus among others. This was made possible through the able facilitation of the MP to ensure that all communities within the district are connected to the national grid. This key achievement was brought into fruition within the space of two years after the MP tirelessly consulted the deputy energy minister for the supply of electricity to these deprived areas. 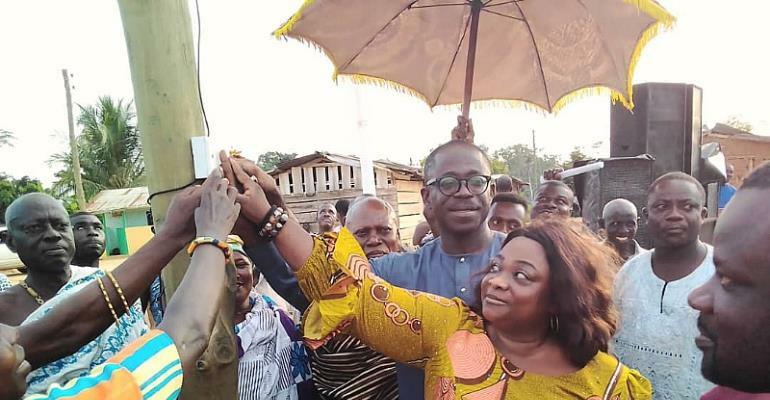 According to Hon Joyce Dei, the monumental achievement was a fulfilment of one of her 2016 parliamentary campaign promises to provide the people with electricity. During the commissioning of the project at Keteke, the MP noted that she was moved by the sad condition of the people and as a result challenged her to find solutions. She promised to fix the bad roads in all communities in the district as well as other life touching and developmental projects. She therefore called on residents to vote massively for her and the NPP come 2020 elections to continue with the good works.